The iconic Las Vegas strip is festooned with a bubbling variety of world-class casinos. On the south end, they begin with Mandalay Bay, The Luxor Hotel & Casino, Tropicana Las Vegas, New York New York Hotel & Casino, MGM Grand, Monte Carlo Hotel and Casino, the Cosmopolitan, Planet Hollywood, Paris Las Vegas, Bellagio, Caesar’s Palace, Flamingo, Harrah’s, the Venetian, and the Mirage to name but a few. These ritzy destinations reel in the players, from far and wide. High rollers from Macau, Hong Kong, and the Chinese mainland flock to Las Vegas to enjoy games of Baccarat, Craps and Mahjong. Hollywood celebrities are routinely seen throwing down big bets at the poker tables at the Rio Suites hotel & casino. And then, there are the millions of tourists from Australia, the United Kingdom, Canada, South Africa, Brazil, Argentina, Russia, South Korea, Europe and beyond that frequent Las Vegas every year. It’s a pulse pounding haven of adrenaline-loaded decadence. Eat what you want, drink what you want, and gamble to your heart’s content. Las Vegas is a sponge, a virtual magnet for thrill seekers everywhere. It attracts the wild side in every one of us, daring us to be a little more adventurous than we would otherwise be at home. Pay to Play – It’s the Las Vegas Way! Of course, all of this frenetic activity comes at a cost. And yes, players, visitors and revelers bear that cost. Fortunately, Las Vegas casinos provide plenty of bang for your buck. The shows are spectacular by anyone’s admission; the food is heavenly, and the entertainment is off the charts. For a gambler, the risks are known. Sure, there are the odd progressive jackpots at the Megabucks slot machine games that get hit every now and then, but overall, casinos remain in business because they have the edge. And everybody is happy with that, because we’re all having a good time. The imposing establishments such as the Luxor with its pyramid architecture and Sphinx statues is a marvel to behold. Perhaps you’re looking for a little European charm? Then Paris Las Vegas is where you want to be. The Eiffel tower is but a few blocks away from anywhere on the iconic Vegas strip. Such is the all-encompassing nature of this adult playground that it makes sense that we throw money around, to enjoy the fiesta. Just how much money do these Las Vegas casinos generate on a daily basis? This has been the topic of much debate over the years. Fortunately, we can put those questions to bed, thanks to a study conducted in 2013. The prestigious University of Las Vegas conducted a study of 23 casinos lining the Las Vegas strip for the fiscal year ending in 2013. It is estimated that these 23 casinos generated $72 million each at that time, for a grand total of $5 billion. Now, when we average that out over 365 days, it amounts to a whopping $630,000 per casino per day. That’s a nifty sum of money for any business, and while not all of it is profit, all of it is revenue. Precisely how these casinos are able to capture such a huge slice of our entertainment dollars is more science than mystery. First of all, there are no windows in casinos since nobody really wants you to know whether the sun is rising or setting. It’s a 24/7 playground of entertainment. And Las Vegas never sleeps! Now for some other good news. When you’re playing at a Las Vegas casino, you will invariably know exactly when somebody has won a jackpot. Why? Because the casino operators want everyone to know when a winner strikes it rich. That’s great publicity for the casino, and it’s like honey to the bees. It brings everybody in to gamble even more. Whether you are a slot machine player, a card player, or a table game player, nothing beats the magnificent appeal of a Las Vegas jackpot. Everywhere you go in Las Vegas, opportunity awaits you. There are cars waiting to be won in raffles, fabulous overseas getaways up for grabs, and life-changing jackpots ticking over everywhere you look. Of course, it helps that these casinos offer you all the perks that money can buy – for free. Complimentary valet parking, complimentary drinks, complimentary entrées, and sometimes even complimentary stays are yours to enjoy. Since they dish out chips at a furious pace, there’s always betting to be had. 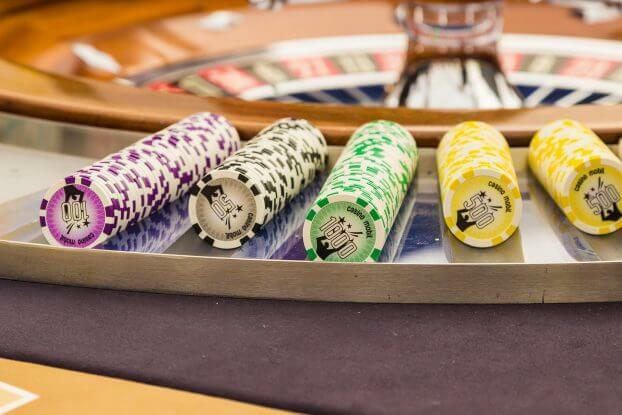 How Do Online Casinos Measure up?